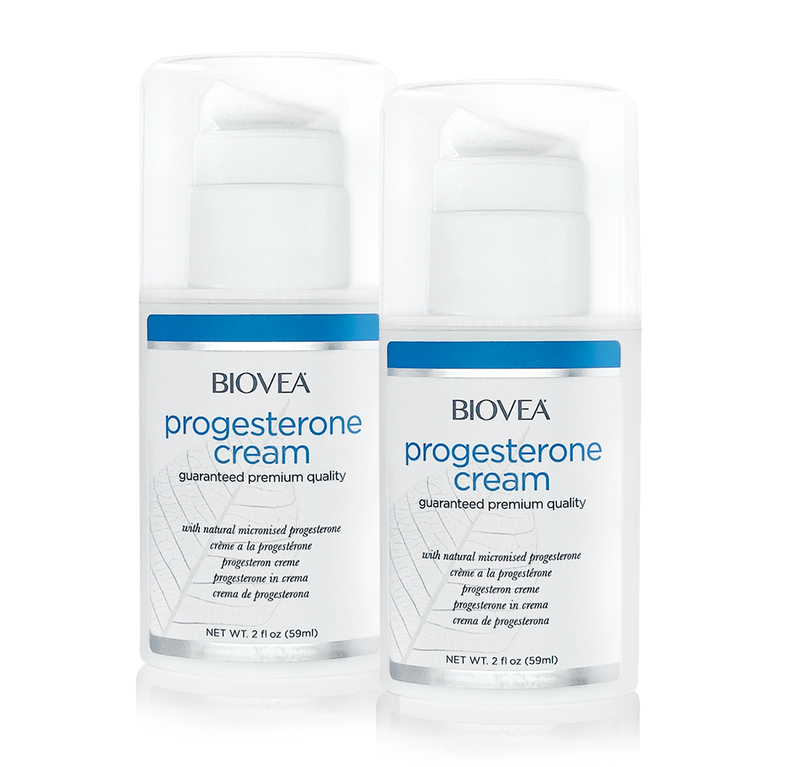 Natural Micronised Progesterone Cream by BIOVEA® contains natural bio-identical Progesterone USP that is formulated to provide relief from menopausal symptoms, giving millions of women a safe and healthy alternative. Progesterone can direct and control the production of other hormones such as Estrogen. Most significantly, it is know that high amounts of Estrogen can induce a host of metabolic disturbances, and the body's natural way of counterbalancing Estrogen is with Progesterone. Progesterone cream helps to achieve a natural balance. What are the effects of low progesterone levels? Why Should You Use Progesterone Cream? During the second half of each monthly cycle, from ovulation until menses, progesterone is designed to be the dominant hormone. Not all women produce sufficient amounts of progesterone during the second half of their cycle. Prior to menopause, as ovarian function wanes, cycles frequently occur where a woman does not ovulate (known as an anovulatory cycle). This period leading up to menopause is referred to as perimenopause. Anovulatory cycles that begin in perimenopause can lead to hormone changes that may result in hot flashes, changes in bleeding patterns, PMS-type symptoms, as well as many other menopausal symptoms. While progesterone levels fall close to zero due to anovulatory cycles at menopause, estrogen levels may only decline to about 40-60% of pre-menopausal levels. Progesterone has a number of important roles relative to menopause. It is the natural balancer to estrogen, as well as being necessary for optimum estrogen utilisation. Research over the years has also revealed other vital roles of progesterone on the heart, blood vessels, nerves and brain. Many women find that supplementing with progesterone allows them to achieve a balance once again. Today we understand that it's progesterone “that other female hormone” that is missing, causing all kinds of subtle imbalances by its absence. And that led us to believe that supplementing the circulating levels of progesterone would curb a whole range of distressing experiences women had simply come to accept as part of being a woman. We'd been told for decades that progesterone is the "pregnancy hormone." So why would we want anything to do with it as we approach mid-life? Well, it turns out that this story is far from the whole truth. Progesterone is the precursor of the mineralocorticoid aldosterone, and after conversion to 17-hydroxyprogesterone (another natural progestogen) of cortisol and androstenedione. Androstenedione can be converted to testosterone, estrone and estradiol. Progesterone is produced in the adrenal glands, the gonads (specifically after ovulation in the corpus luteum), the brain, and, during pregnancy, in the placenta. When our ovaries begin gently signaling that they do not want to continue the task of producing an egg every cycle, they don't do it by dropping estrogen levels. Instead, we start to experience the odd cycle when no egg is produced. In those months, the ovaries do not produce progesterone. And the relation between estrogen and progesterone levels in our bodies begins to change. We know now that it's progesterone that affects our hearts, our blood vessels, our nerves, our brains and even our estrogen activity. Because progesterone does so much more than manage fertility, its decline can produce a lot of dramatic effects. We experience these effects as hot flashes, anxiety, sleeplessness, changes in sexual energy and vaginal changes. How Much Progesterone is available? Progesterone cream is manufactured to contain 59 total grams of cream per container. Each 1.1 grams (one dose) contains 20mg of natural progesterone. Each container contains approximately 50 doses. Careful clinical research has shown this to be an effective amount to achieve a natural balance. Purified Water, Glycerin, Palm Oil (Isopropyl palmitate), Vegetable Stearic Acid, Caprylic/Capric Triglycerides, Glyceryl Stearate, Emulsifying Wax NF, Progesterone USP, Phenoxyethanol, Caprylyl Glycol, Carbomer, Sodium Bicarbonate, Potassium Sorbate, Allantoin, Lecithin, Evening Primrose (Oenothera biennis), Tocopherol, Grape Seed (Vitis vinifera) Extract, Burdock (Arctium lappa) Root Extract. Use only as directed. Apply to soft areas such as the inner arms or thighs. Rotate application areas daily to avoid saturation. Pre Menopausal Women: Apply 1 pump daily, 14 days before expected menses, discontinue use 1-2 days before menses and start again 10-12 days after menses (counting the first day of menstruation as day 1). Post Menopausal Women: Apply 1 pump daily for 21 consecutive days and discontinue use for 7-10 consecutive days. Warning: Do not use if you are pregnant, lactating or intend to become pregnant. For external use only. Avoid contact with eyes. Discontinue if rash or irritation occurs. Use intended for adults 18 years of age and older. Do not exceed 2oz. (59ml) of this product topically per month. Consult with your physician before using this product. Keep out of the reach of children. Store in a cool, dry place. This Progesterone has saved my life. I am able to sleep and feel much better. Totally recommend. I was using a similar product through my health care professional but it was costing me about four times as much so I tried this. Works the same and saves me a lot of money! I am a 50 year old female in perimenopause. I have not yet entered menopause as I still get a period about every 6 months. For the past year I have dealt with night sweats, hot flashes and terrible headaches. My blood tests have shown that I had low progesterone levels so I started using this progesterone cream. It took about a month to see results but I no longer have any of the symptoms mentioned above. Three months later, I'm still symptom free, hoping that it will stay this way. For others dealing with similar symptoms during this period of transition, get your blood work done to see what your levels are and if you require progesterone, I would recommend trying this product. Been using this for about 6 months now an seems to reduce the flushing by about 70% ! Have tried another brand 'Now' which is cheaper however it was ok. It had an awful lot of ingredients in it, a lot of herbal stuff possibly for fragrance, but I don't feel they are needed in the product and it just seemed to make it hard to rub in, the Biovea is simple and rubs in easily., hence the reason I continue to use it ! Love the Value pack as its great on the budget. I have been using this product for a few years and will continue until I need to stop. I was having my period every 2 weeks so was naturally feeling awful having to cope with that. I heard of this cream and started to use it. I now am regular and feeling soooo much better. No flushes or sweats and feel awesome. Also thanks for the prompt delivery everytime I order. I have suffered for years with post menapausal sweats, with out no relief from the medical front I really didt know where to go or what to do next. It is the most uncomfortable thing going as many ladies will know, when you are dripping with sweat. I was then told about progesterone cream, I have now used it for several years. For me it is the only thing that has helped. Although it has not stopped the sweats completely it has made them far more manageable. Before swear ran of me in rivers, hard to believe but true. Now I just become warm and sweat slightly. I don't know what Id do with out this cream. I had been using prescription bio-identical progesterone cream, but was having side-effects so I stopped. I have been using Wellsprings Serenity natural progesterone cream for over 10 years now (which is a great product), but decided to try this one as it is easier to order and combine for free shipping via Biovea. Well I am totally satisfied and I will be using this brand from now on. Another plus, it comes in a pump format instead of a jar, and is less expensive for the same quality as Wellsprings. I've been using this 'miracle' cream for the past 3 months, I noticed a difference after the first 2 weeks, no aches & pains, sleeping improved, slight weight loss, more energy, I feel normal again. Tried other brands but not as good as this and the dispenser make it so easy. Elaine (54) in the Rep of Ireland. I would highly recommend it. Great product lovely and smooth and easy to use. Will be ordering more soon.